Pembrokeshire, United Kingdom The Llansteffan Coastguard responded to Saundersfoot beach to reports that a UXO had been found buried in the sand. The Royal Navy Bomb Disposal Unit then responded to detonate the item in place after clearing the area. The exact type of UXO was not reported. 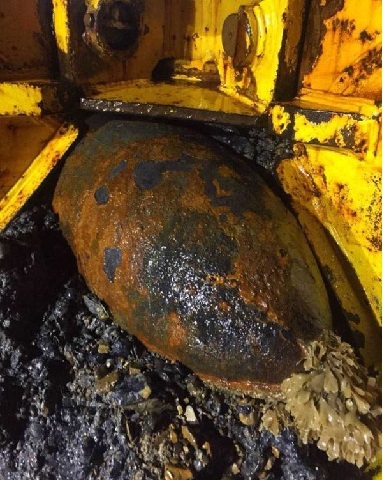 Lancing Beach, United Kingdom Two unexploded WWII munitons (type not reported) will be detonated in a controlled explosion this week off the coast of Lancing Beach. 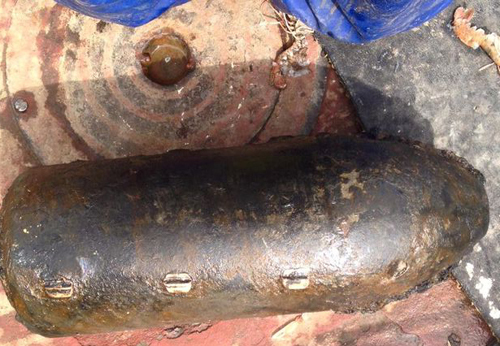 The UXO was found during construction of the Rampion offshore wind farm. The items, found at a depth of 13 meters during an earlier conducted UXO survey. Selsey, United Kingdom The crew of dredging vessel 'Arco Dee' made an unusual discovery while off-loading their vessel in Shoreham Harbor - a UXO. The Captain of the dredger called the Coastguard to report the find. A response team from the Littlehampton coastguard rescue squad was dispatched to the scene along with the Sussex Police. Since the item was military ordnance, the Royal Navy Southern Diving Group was called to respond. The UXO was identified by the Royal navy team as a 3-inch WWII era British shell. The team successfully disposed of the ordnance item without incident. Mosman, Australia The Australian Navy was called in to investigate a report from a snorkeler who confused a pair of sea urchins for unexploded anti-shipping mines. He was snorkeling at Mosman near Sydney when he encountered the creatures which he believed to be WWII sea mines. The police, who had doubts, showed the man pictures of both mines and urchins, but the man insisted they were indeed UXO. A maritime exclusion zone had to be established around the area until Naval experts determined that they were actually two large sea urchins among the rocks on the seabed. Perhaps the snorkeler mistook the urchins' tentacles for the "chemical horns" of a sea mine. These horns are the firing devices which project from the spherical casing of a sea mine. These horns are made of a soft lead which covers a electrolyte-filled glass vile. When a ship bumped against one of these horns, the glass vile would break open, allowing the electrolyte to flow between two contacts, closing the firing circuit and detonating the mine. Campbeltown, Scotland Trawler skipper and third generation fisherman, Ciaran McIntyre, pulled up a munition in his nets while fishing offshore. Instead of calling authorities to report the find, the captain decided to bring the item back to port in Argyll. While on-route and at port, he even took photos of the find and posted them on social media with the caption - "Anybody got any info on origin and age?" A reply read "Don't go chipping the barnacles off to find out." When the harbor master at the port caught wind of the find, he declared a full-scale emergency and shut down the port. Military EOD from Faslane Naval Base responded to the live shell and safely relocated it for disposal. Doggers Bank, North Sea The Royal Netherlands Navy mine hunter HNLMS Makkum cleared a 4,000-pound bomb found by fishermen at the Doggers Bank, a shoal in the North Sea about 200 miles off the Dutch coast in the North Sea. The WWII-era UXO, known as a "Blockbuster," was designed to blast away a dwelling. Before detonating the bomb, marine mammals were encouraged to swim away from the site by a sonar system generating a high-frequency response. The bomb was lifted up to 10 meters below the waterline to reduce the damage of the blast. A diver was sent down to inspect the ordnance. It was concluded from this observation that the Blockbuster's 1800 kg of explosives had leaked away during the munition's 70 years underwater. 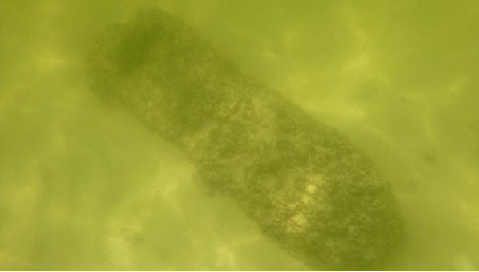 Manatee County, Florida The Tampa Bay Regional EOD Bomb Squad successfully detonated a WWII photo flash bomb found in the water just north of Anna Maria. U.S. Fish and Wildlife officers found the device in two feet of water off Passage Key. Florida Fish and Wildlife Conservation Commission officers contacted MCSO's Marine Unit for additional assistance. Passage Key, a sand bar north of Bean Point, is uninhabited. Burry Port, Wales A family beach trip was made even more exciting when they discovered a large "buoy" onshore at Burry Port. Mom took pictures and videos of her 6-year-old and 4-year-old posing with the barnacle-covered item, which her son even knocked on and touched. Vero Beach, Florida Federal officials plan to close parts of some beaches and neighborhoods in the south part of Indian River County to clean up dozens of munitions unearthed along the coast of Vero Beach. The USACE will order evacuations of nearby homes for about six hours each day during the operations. Contractors for the Army Corps found five, 500-pound bombs, four warheads, and two rockets more than 100 yards offshore while they were removing military-associated debris from the coastal waters. The contractors will lift the items from the sea bed and transport them one mile offshore to a designated disposal area for underwater detonation.